Panting is totally normal! It helps dogs cool off and is also a natural response when a dog is thirsty, excited, happy or scared. Panting isn't normally a reason for concern, but if your dog is panting excessively, it could be a possible sign of heat exhaustion or overexercise. If you're an avid jogger who likes to run with your furry friend, try these tips for safe and healthy exercise with your dog if they seem to be panting a lot. If heavy panting is accompanied by other symptoms, you should have your dog checked by a vet. Panting is normal, but watch out for signs of heat exhaustion and other stresses! Could your pup be trying to tell you something with his panting? If your dog is panting excessively during exercise, especially if the activity isn't very strenuous, Pet MD advises that this could be a symptom of a heart problem. Watch for heavy panting paired with coughing, lethargy and an inability to get comfortable. These symptoms may be a sign of a progressive heart value malfunction called mitral insufficiency. Take your dog to the vet if excessive panting is combined with increased hunger and thirst, weight gain, a swollen abdomen and issues with reproductive organs. These symptoms can indicate Cushing's disease. Males can experience shrinking testicles while females will not go into heat. Dogs inflicted with Cushing's may develop hair loss and thin, easily bruised skin. Sleeping problems and lethargy are also common symptoms. According to Vets Now and Drs. Fosters and Smith, veterinary experts, dogs are subject to heat stroke in extreme temperatures, especially since panting is their only way of cooling down. In extremely hot weather, watch for signs of heat stroke, including heavy panting, rapid pulse and drooling. Your dog's extremities may be hot to the touch. Avoid the potential for heat stroke by providing outside dogs with plenty of shade and fresh water. Try not to do any strenuous activity on hot days, or change your walking or jogging routine to early mornings or in the evening after the sun has gone down. During stressful situations, like traveling to new places or meeting other animals or people, heavy panting and rapid breathing may be signs of anxiety. Your pup may cry, whine and even become agitated when you leave him alone if he has separation anxiety. Extreme conditions that can't be calmed through training may require medical attention. 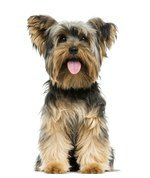 Is your dog panting because of stress? If your dog seems to pant for no clear reason or if his behavior is out of the norm, a checkup can help you rule out other potential problems, such as weight-related issues or lung disorders. Your vet likely will perform a physical exam and may take X-rays, perform blood tests and study urine and stool samples. Help your vet make a proper diagnosis by making notes about when your dog experiences unusual panting and describing any other physical symptoms he's experiencing.